Evan was born and raised in sunny San Diego. Since he was a kid he always loved to draw; cartoons, comic books, and video game characters. Since his early teen years, he dreamed of being a tattoo artist. During his high school years, he would sell his designs to kids who got their buddies to tattoo them. After graduation, he needed to work and put his tattooing dream aside for a few years. 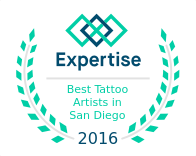 He worked not far from SD Tattoo’s location and spoke regularly to Dustin, one of SD Tattoo’s senior artists and finally asked if he could help him pursue his career in tattooing. Not only did Dustin see his artistic skills, but SD Tattoo did as well and that’s when his tattooing career began. Evan continues to strive, learning the trade and improving his art knowledge. 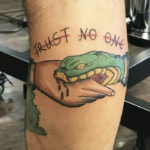 He enjoys doing traditional style tattoos, bold lines, and vivid colors, but is learning to be a well-rounded tattoo artist, expanding his art forms to black and grey and even realism when ready. When not at the shop, he spends his time drawing with colored pencils and graphic design, expanding his artistic skills whenever given the opportunity.